Michael Redgrave in Dead of Night. 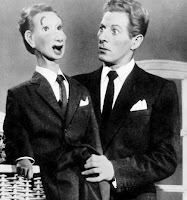 The difficulties inherent in injecting a distinct personality into a wooden dummy have caused identity problems for a number of movie ventriloquists. 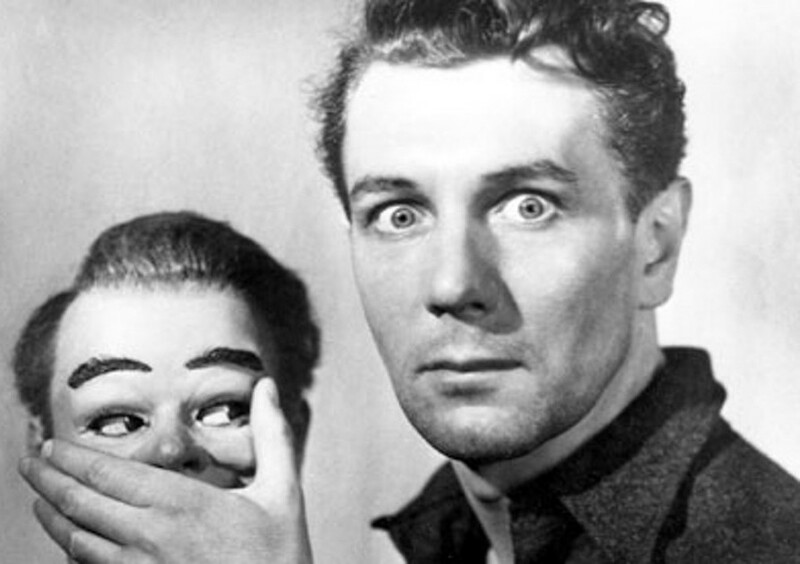 In the most chilling story in the classic anthology Dead of Night (1945), ventriloquist Michael Redgrave went insane after becoming convinced that his foul-mouthed dummy Hugo was looking for a new partner. Anthony Hopkins gave a tour-de-force performance in 1978’s Magic as another mentally-unstable ventriloquist taking murderous advice from a dummy with an apparent mind of its own. Another dummy named Hugo (an obvious reference to Dead of Night) really did have a soul in the underrated 1964 fantasy Devil Doll. Bryant Halliday starred as Hugo’s “partner,” a ventriloquist who has transferred the soul of his assistant into his dummy. 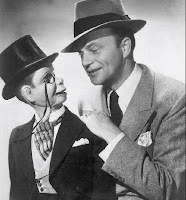 Aside from horror films, the most famous film ventriloquist remains Edgar Bergen. He enjoyed a prosperous career during the late 1930s accompanied by dummies Charlie McCarthy or Mortimer Snerd in comedies like A Letter of Introduction (1938), Charlie McCarthy, Detective, (1939) and the W.C. Fields vehicle You Can’t Cheat an Honest Man (1939). He earned a special Academy Award in 1937 for his creation of Charlie McCarthy. Danny Kaye in Knock on Wood. 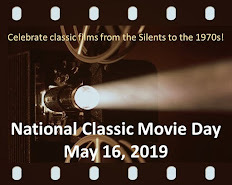 Major stars who have played ventriloquists include Erich von Stroheim in The Great Gabbo (1929), Danny Kaye in Knock on Wood (1954), and Lon Chaney in both the silent and talkie versions of The Unholy Three (1925 and 1930). In 1984’s Broadway Danny Rose, theater agent Woody Allen had a hard time finding employment for a stuttering ventriloquist. Although it was a TV episode on Alfred Hitchcock Presents, I feel compelled to mention "The Glass Eye." This haunting tale about a lonely woman and a ventriloquist starred Jessica Tandy and Tom Conway. It's highly recommended! I'm a big fan of MAGIC. Always felt it was underrated. As many times as DEAD OF NIGHT has been on TCM, I still have not seen it. The combination of Fields and Charlie McCarthy is a thing of beauty. John, like you, I think MAGIC is a fine film. Anthony Hopkins should have gotten an Oscar nom. By the way, it's first movie I took my wife (then girlfriend) to on an "official date." Unofficially, our first film was WATERSHIP DOWN. I really, truly enjoy the work of ventriloquists from the first time I watched Shari Lewis as a kid. However, those horror flicks never can get out of my head! Cliff Robertson in The Twilight Zone: The Dummy really frightened me. Such fear from Robertson's character. It equaled those in the longer movies, maybe more because of the compression. I will keep your list handy, but I'm not sure if it will be for watching or avoiding. Ha! Yes, that was an outstanding TZ episode. I should have mentioned it! Thanks for this list, Rick. I didn't realize how many films featured ventriloquists. Magic is probably the only movie made from a William Goldman book that I have yet to watch. I love his work, especially the fact that he has a damn good ear for dialogue. I want to see Magic, but DVD rental places are dying out. (The last of our local ones just closed up last year. I always find ventriloquist dummies very unsettling. Like Caftan Woman I might be avoiding these. In Candice Bergens auto biography she says Charlie McCarthy had his own bedroom and it was better than hers. Wonderful post, featuring those absolytely fascinating dummies! I love 'em all! Speaking of Bergen, all the various short subjects starring Edgar and his dummies are HILARIOUS -- really, really truly funny. Charlie is insulting, snarky, so fast, completely contemporary in his delivery. Priceless! 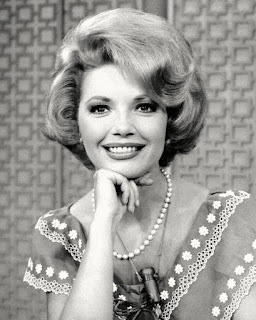 Don't miss the episode of "The Jack Benny Show" where he goes to visit the Bergen house -- absurd, amazing, brilliant comedy, and you get a lovely rendition of "Them There Eyes" from the gorgeous Mrs. Bergen. Ventriloquists can be annoying and weird or catchy & perfect. Bergen was the latter. It's unfortunate that Kaye's "Knock on Wood" is nearly forgotten as it's a cute romp. Thanks for allowing us to "vent" about this great topic! !